Is this what society has become? Do we accept the suffering and abhorrent deaths of animals aboard vessels in a trade which is inherently cruel as NOTHING? The arrival of the animals into countries with high temperatures and high humidity is the beginning of yet another ultimately shameful, unforgivable and terrifying series of events. Animals are offloaded under inhumane and uncaring circumstances. They are thrown, driven, belted and hacked to get them under control. Cattle are immobilized by men who slice the tendons in their legs to bring them down and poke out their eyes with knives to force the cattle to drop. 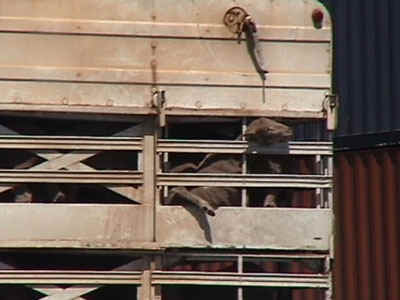 Every time we see a truck loaded with animals heading for a port we feel ashamed to be Australian. We have all driven alongside or behind 4 tiered road trains carrying sheep and have been distressed and sickened by the sight of limbs of trapped sheep sticking out of the bars, faces and heads squashed against the rails and we have felt the absolute despair when we looked into the eyes of these helpless creatures. These animals are still under the protection of The Animal Welfare Act 2002, in Western Australia , right up until the time the loaded ship sails. The Codes of Practice for Transport and the Australian Standards for the Export of Livestock are unfortunately, entirely voluntary and self regulatory and because of the overwhelming number of road trains (trucks) and the pitifully few inspectors, prosecutions for breaches of the Animal Welfare Act 2002 are rare. Latest development: Landmark decision: The Police bring animal cruelty charges against Emanuel Exports. After the Cormo Express fiasco the Federal Government appointed an independent inquiry (Keniry Inquiry Report) to audit the live export system and report back with recommendations. The recommendations were never taken up by a Government determined on ensuring that this trade continues ‘unhindered’ with animal welfare measures. The Australian Standards for Export of Livestock were born again. These standards are now mandatory and enforceable. A sheep truck with 4 levels averages 450 sheep. Even with 1% morality rate, (less than the "accepted rate of 2%") in the 6 million sheep exported last year, that is the equivalent of 133 semi trailers of dead sheep. The transport of live sheep, cattle, wild and domesticated goats, deer, buffalo, emus, domesticated horses and wild camels is just the beginning of the stress, pain and fear the animals will experience on the road to the ultimate barbaric slaughter overseas. The slaughter of animals in Australia is strictly regulated to ensure that suffering is minimized. 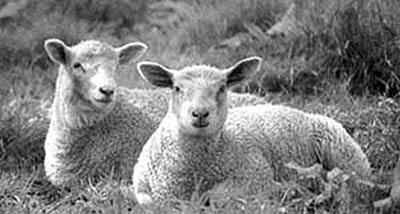 There is legislation in Australia requiring animals to be pre stunned prior to slaughter. Halal abattoirs must adhere to the same regulations. The same cannot be said for slaughter of animals in many overseas countries. There are no regulations, no controls and it is certainly not humane. Live animal export is without doubt, cruel and perverse. 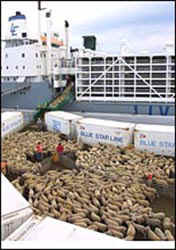 After the animals have been loaded onto the livestock ships, it goes from bad to worse for the doomed animals. It has been said that the animals who die on the voyage are the lucky ones. The overseas journey takes its toll and the Australian government considers a 2% mortality rate for sheep and goats, and 1% for cattle as acceptable. That is an incredible death toll for a shipment of 50,000 to 70,000 sheep and that is the "official" toll. In reality it is much higher. Statistics from relevant Government departments on mortality rates are not readily available for all animals exported live. As was reported on 60 Minutes, it would appear that the official figures provided for sheep and cattle differ from the real mortality rates. The report: An Action Plan for the Livestock Export Industry or APLEI, was drawn up by AFFA, AQIS, ALEC LiveCorp, MLA and AMSA in October 2002, which stated that "Consignments of goats (particularly feral goats) have been associated with high mortalities averaging in excess of 2.3%..." "Goats are inherently more difficult than sheep and cattle to prepare and transport." Many animals routinely die because of breakdowns in ventilation systems on board the ship, bad weather and rough conditions. Suffocation, starvation, dehydration and disease, sleep deprivation, diarrhea, heat stress, respiratory disease, trauma, pneumonia, motion sickness all take their toll and the animals who collapse, stay where they fall and die slowly and painfully. This use of the simplistic term "accepted mortality rate" in the regulations, firstly recognises the absolute certainty of animal deaths aboard every voyage. The Government and industry know there will be suffering and deaths of animals. Their verbal assurances that animal deaths is not in the best interest of the exporters, which are insured against losses, is worth nothing! Secondly this term completely fails to acknowledge the suffering and eventual deaths of thousands upon thousands of animals who are considered irrelevant because their deaths may fall into the BELOW "accepted mortality rate" category. Is this what society has become? Do we accept the suffering and abhorrent deaths of animals aboard vessels in a trade which is inherently cruel as NOTHING? The arrival of the animals into countries with high temperatures and high humidity is the beginning of yet another ultimately shameful, unforgivable and terrifying series of events. Animals are offloaded under inhumane and uncaring circumstances. They are thrown, driven, belted and hacked to get them under control. Cattle are immobilized by men who slice the tendons in their legs to bring them down and poke out their eyes with knives to force the cattle to drop. Animals are left with broken bones and other painful injuries until they die or are slaughtered by having their throats cut and left to bleed to death. These activities have been filmed, documented and reported to the world. There is no excuse for this kind of ignorance and barbarity. There is no religious or cultural excuse for this kind of cruelty. This trade is unacceptable to any reasonable, compassionate society and Australians have every reason to be outraged by the live animal export industry. It is uncivilized, cruel and unnecessary to treat any animals in this way when there are economically viable and humane alternatives. Opposition from both rural and city folk, to Australia 's live animal export industry grows day by day as people see past the trade's propaganda and appreciate the extent of the horrific treatment, stress and cruelty suffered by the animals. Some sectors of agricultural production are absolutely appalled by this industry and the resultant decimation of the economies of many small Australian rural communities. The economics of the live animal export trade are questionable. Its impact on the Australian work force has been negative and over 17,000 jobs have been lost to overseas interests along with the profits. Despite those economic considerations — this industry brings in around $900 million per annum, it comes at a far greater cost and Australians are saying this barbaric trade is not worth it. There is no reason to continue with this trade. The Government and industry have always advocated that there is a lack of refrigeration and infrastructure in these countries therefore there is a need to provide live animals. Saudi Arabia alone has spent one trillion dollars on infrastructure and there is more than adequate refrigeration in the Middle East. They have supermarkets in both the cities and outlying communities equal to the very best in Australia, providing all forms of fresh processed packaged meat. We know and are very concerned that this export trade has provided millions of animals and still does, for a sacrificial ceremony which happens every year, to the detriment of thousands of Australian jobs. The money this trade returns can be replaced with processed meat. The reality is that there are a few exporters and overseas importers who make an enormous amount of money while economies of rural and regional Australia are dying due to abattoir and related industry closures which provided the bulk of employment in many towns. The ultimate price is paid by the thousands and thousands of animals suffering and dying in deplorable conditions due to this live export trade. These animals are the innocent victims of human greed.